Selena Gomez confirmed on her coffee run in Los Angeles yesterday that dinosaurs are having a moment. Yes, dinosaurs. 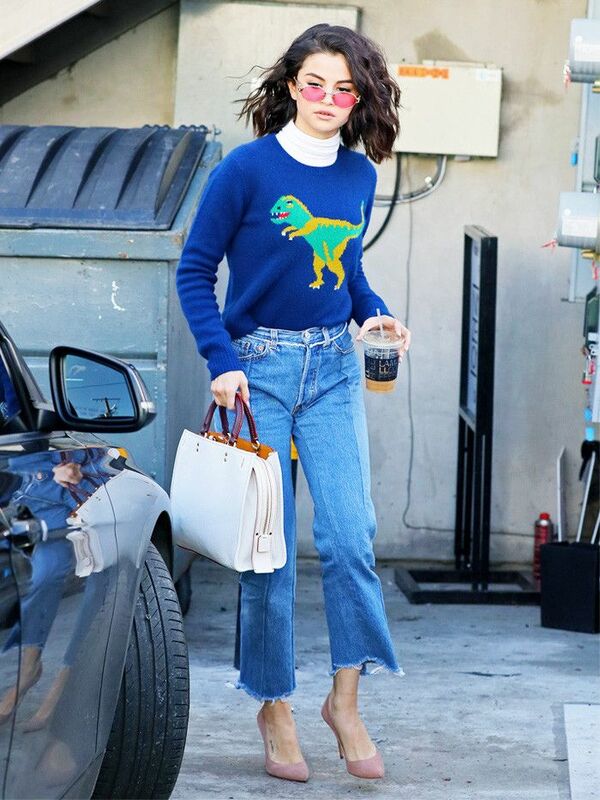 According to Lyst, searches for the word dinosaur are up 43% month on month, with traffic to dinosaur-themed clothing soaring by 52%, which has a lot to do with the Dino Coach jumper Selena wore yesterday. Ross Geller would be so proud. Selena paired her navy blue Coach jumper (which is now sold out) with Vetements distressed jeans, rose-coloured glasses and suede Kurt Geiger court shoes. We particularly like how she layered a thin white rollneck underneath her geeky Coach crewneck. According to Lyst, dinos are the third-most popular species in the fashion animal kingdom, as elephants are currently the most sought-after animal thanks to Loewe's elephant bags, followed by roosters. On Selena Gomez: Coach dinosaur jumper; Vetements Jeans; Kurt Geiger Ellen Suede Court Shoes (£150).